Custom Embroidered Full Zip Hooded Sweatshirts, Nublend, Heavyweight and Cross Grain. 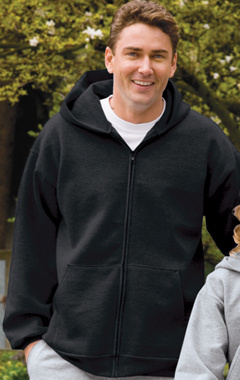 Custom embroidered full zip hooded sweatshirts & 1/4 zip sweatshirts are great for any age or occupation. Heavyweight to lightweight, brands such as Fruit of the Loo, Port & Company, Hanes, Jerzees and Sport Tek with Nublend & cross grain fabrics. Custom embroidered logo included in price. These fabulous full zip, 1/4, 1/2 & NEW Lace Up hooded sweatshirts are almost like a jacket they offer an easy on and easy off style for no hassle. Custom embroidered with your logo and make this a stunning, yet casual look. Various weights from light to heavy and no pill fabric for a long lasting shirt you can wash and wear for years. Set-in sleeves, Kangaroo pouch pocket, Dyed-to-match drawcord (Ash and Athletic Heather have white drawcords). Custom embroidery included. Tall & Youth Sizes Available! Custom embroidered 4999 Jerzees 9.5 oz., 50/50 Full-Zip Hooded Sweatshirt. 9 oz. 50/50 full zip NuBlendT hooded sweatshirt Pill free. 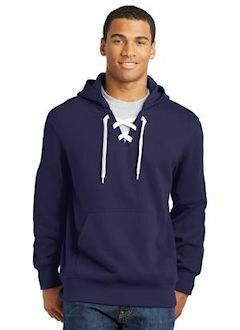 Jersey-lined hood with grommets and matching drawcord. Split front muff pocket. Ribbed cuffs and waistband with Lycra spandex. Custom embroidery included. Custom embroidered 82230 Fruit of the Loom 12 oz. SupercottonT 70/30 Full-Zip Hood . 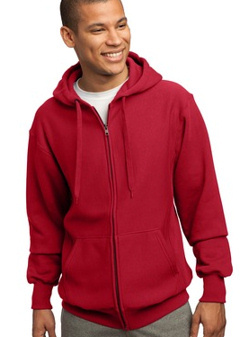 70% cotton, 30% polyester preshrunk blend fleece; label free; ribbed cuffs and waistband with spandex; double-needle stitched collar, armholes and waistband; single-ply hood with matching tipped drawcord; pouch pockets. Custom embroidery included. Our heaviest weight custom embroidered Sport-Tek® - Super Heavyweight Pullover Full Zip Hooded Sweatshirt. F282. The most warmth you can get out of a sweatshirt. 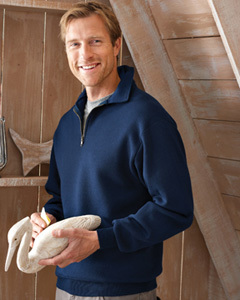 Our super heavyweight fleece is built for unparalleled comfort. 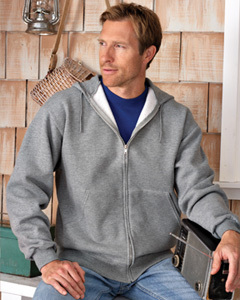 12-ounce, cross-grain 80/20 ring spun combed cotton/poly, 2x2 rib knit cuffs and hem with spandex, Rib knit side gussets, Twill taped neck, Antique nickel-finished zipper, 2-ply hood with dyed-to-match lining and drawstring, Set-in sleeves, Front pouch pockets. Custom embroidery included. Custom embroidered G188 Gildan 8 oz. Heavy BlendT Vintage Classic Quarter-Zip Cadet Collar Sweatshirt. 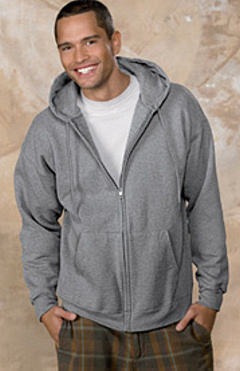 50% cotton, 50% polyester Heavy BlendT fleece; Air jet yarn creates a smooth, low-pill surface for printing; Cross-dyed shades (two colors in one fabric); Contrast Dark Grey trim; YKK brass zipper; 1x1 athletic rib with spandex; Fleece lined collar; Double-needle stitching throughout; Double-needle cuffs; Custom embroidery included. 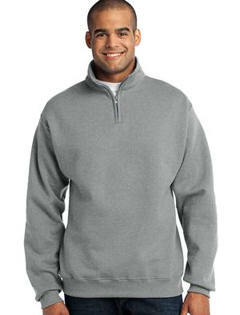 Custom embroidered JERZEES ® - 1/4-Zip Cadet Collar Sweatshirt. 995M. 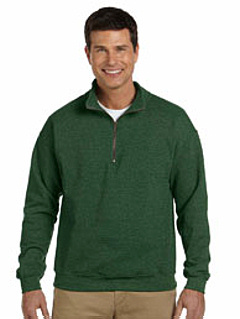 8-ounce, 50/50 cotton/poly NuBlend ® ; pill-resistant fleece (preshrunk). High-stitch density for a smooth-printing canvas. Stylish zip-through cadet collar. Covered metal zipper for maximum print area. Rib knit cuffs and waistband. Double-needle coverstitching on armholes and waistband. Concealed aluminum zipper. Custom embroidery included. Custom embroidered 994MR Jerzees 8 oz. 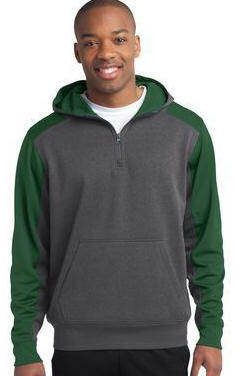 NuBlend® 50/50 Fleece Quarter-Zip Pullover Hood . 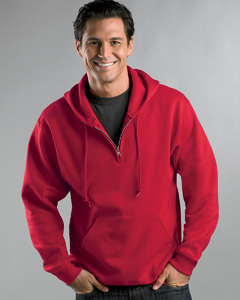 50/50 cotton/poly NuBlend® preshrunk fleece; double-napped fleece provides a loftier, softer feel; high-stitch density for a better printing canvas; double-needle coverseaming on neck, armholes and waistband; one ply hood with grommets and matching drawcord; 1x1 ribbed collar, cuffs and waistband; seamless body with concealed seam on cuffs . Custom embroidery included. Custom embroidered 4528 Jerzees 9.5 oz. Super Sweats® 50/50 Quarter-Zip Pullover . 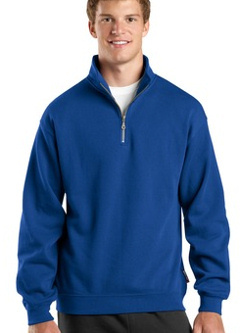 50% cotton, 50% polyester NuBlendT preshrunk fleece; high stitch density for a better printing canvas; double-napped inside for a softer feel and increased loft; virtually pill-free; double-needle coverseaming on neckline, armholes, waistband; set-in sleeve; brass-tone zipper; self material cadet collar; 1x1 ribbed cuffs and waistband with spandex . Custom embroidery included. Custom embroidered Sport-Tek ® - 1/4-Zip Sweatshirt. F253 . The most warmth you can get out of a sweatshirt. Designed for lasting good looks, this athletic cut sweatshirt is colorfast with minimal shrinkage. 9-ounce, 60/40 ring spun combed cotton/poly, Athletic Heather locker patch, Twill-taped neck, Set-in sleeves, Antique brass finished zipper, Rib knit cuffs and waistband. Custom embroidery included. Tall Sizes Available!